Introduction – Nagalapura is a small village situated in Tiptur taluk of Tumkur district of Karnataka. This otherwise ordinary town has two Hoysala period temples, one dedicated to Shiva and the other to Vishnu. The history of the village before the Hoysala period is unknown however it is evident that this village attained enough importance during that period that two temples were erected within a small gap of time. Not many inscriptions are found at this place, therefore constructing its history would be a hard task. Inscriptions – Though there are three inscriptions at Nagalapura are mentioned in the contents of Epigraphia Carnatica but only one is provided with details. On a stone in front of the village – No 17 of Tiptur, Epigraphia Carnatica vol XII – dated about 1576 CE – It mentions that on the specified date, the brahmans of Nagalapura granted a kodige to some nayaka. Monuments – There are two temples in the village, both under the maintenance of ASI (Archaeological Survey of India). One temple is dedicated to Shiva and one to Vishnu. Both the temple can be placed to mid thirteenth century CE, as no foundation inscription is found so accurate dating cannot be made. Kedareshvara Temple – This ekakuta (single sanctum) temple faces east and is dedicated to Shiva. It is consisted of a garbha-grha (sanctum), an antarala (vestibule) and a navaranga (closed hall). There would have been a porch but it has disappeared. Though the garbha-grha faces east however the main entrance to the temple, through navaranga, is on its southern side. The garbha-grha is modeled on a sixteen-pointed star plan. The shikhara (tower) of the temple has not survived. Gerard Foekema puts this vimana in full start category. His reason being that the aedicule constituting this vimana are all turned on its axis. The vimana measures 4.8m in length. This temple belongs to the matured Hoysala architectural phase. This phase is distinguished by the series of the bands of the adhisthana of the temple and the eaves over the external wall images. Both these features are evident in this temple. The arrangement of bands found here, over the adhishthana (platform), is consisted of six separate horizontal friezes. These are, from below, a frieze of elephants, a frieze of horse-men, scroll-work, empty band intended for Puranic sculptures, a frieze of makaras with riders on it and a band of swans. The frieze which is usually used for depicting Puranic scenes is empty here, which suggests that it was left incomplete by the sculptors. Among the various images adorning the external walls of the temple, some noticeable images are Gajasamharamurti, Arjun aiming for fish, three-legged Bhringi, Bhairava, Shiva as Tripurari, Durga, Nrrtti, Uma-Maheshvara, Kamadeva, Mahishasuramardini and Shiva as Tandaveshvara. The navaranga is divided into nine equal compartments with its central roof supported on the shining lathe-turned pillars. The designs of each ceiling are different with the central one adorned with ashta-dikpala arrangement. Inside are found various loose sculptures, Surya with Usha and Pratyusha on either side of his feet, Vishnu, Kartikeya, Sarasvati and Sapta-Matrikas. There is one niche in the hall in which Ganesha is housed. A Nandi is also placed in navaranga facing the sanctum. The antarala and the sanctum are of the same size square. The antarala doorway has Uma-Maheshvara on lower lintel while Tandaveshvara on above lintel. Davrapals are placed on either wise of the doorway as separate sculptures.. A small shivalinga is placed inside the sanctum. The linga is in worship but not many come to pay homage. Channa-keshava Temple –This ekakuta temple was very much ruined and has been reconstructed with its falling material. The temple, as it stood today , consists of a garbha-grha (sanctum), antarala (vestibule) and navaranga (closed hall). There might have been a porch attached to navaranga in earlier times, but it has disappeared completely. The garbha-grha is a stellate structure with sixteen-pointed star plan. The adhishthana (platform) of the temple has arrangements of the characteristic Hoysala bands, six in numbers. These bands depicts, elephants, riders on horses, scroll work, blank frieze where Puranic scenes are usually carved, makaras and swans. Presence of these bands suggests that this temple belongs to the matured Hoysala phase. The navaranga is a square hall, measuring 20 feet square, and its door has been reconstructed by materials from ruins as stated in an inscription dated 1920. The central roof is supported on four lathe-turned pillars, thus dividing the hall into nine equal compartments. These once wore four bracket images at each one, however these images are lost. Ceilings of the various sections of the hall are executed in different designs, mostly of concentric circles. Also are found concentric octagon, squares etc. The central ceiling has an arrangement of ashta-dikpalas on its lower bands. The antarala doorway is guarded by two guardians on either side on the jambs. On either side is found perforated screens. The tower above the garbha-grha has no more survived. An image of Venkatesha is placed inside the garbha-grha. The image appears to be of Vijayanagara period, the original image of Keshava is missing. The external walls of the shrine are embellished with various icons of Vaishnava cult. Noticeable among these are, Hayagriva, Vitthala, Venugopala, Yoga-Narasimha, Ugra-Narasimha, kevala-Narasimha, Vishnu over Adi-Shesha, Dhanvantari etc. How to Reach – Nagalapura is about 15 km far from Turuvekere. From Turuvekere, take NH 150A and take a right turn towards Kachihalli. This road will take you to the temple directly. For more details, visit the Maps section of this website. Nagalapura is a small village, you may get some light snacks, Turuvekere is the nearest large town where you can get proper food. If you are looking for stay option, TUmkur would be the nearest town to have proper ones. Annual Report of the Mysore Archaeological Department for the year 1939. Government Branch Press. Mysore. Collyer, Kelleson (1990). The Hoysala Artists, their Identity and Style. Directorate of Archaeology and Museums. Mysore. Foekema, Gerard (1996). 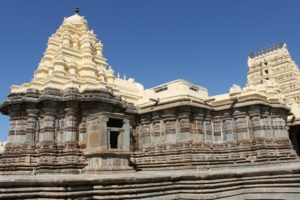 A Complete Guide to Hoysala Temples. Abhinav Publications. New Delhi. ISBN 9788170173458. Patel, M Radha (2001). Life and Times of Hoysala Narasimha III. Mysore University. Mysore.